The 3M Aqua-Pure Whole House Water Filtration System is an extra- large system designed to reduce sediment and dirt throughout the entire home. It also reduces chlorine and other heavy metals such as manganese, iron, and lead. This product helps cleanse water, as well as protect pipes and appliances that use water from hard materials that would corrode and harm them. 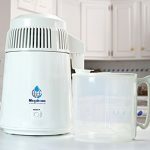 There are some features that come with this product that make it truly unique, and are what sets it aside from other, similar water filters. The most highlighted features of the Aqua-Pure Whole House Filtration System are listed below. Stainless steel head is 100% non- corrosive and will last years! “Sweat in place” system makes for an easy installation! High flow rate can provide up to 20 GPM, one of the highest flow rates for water filters! Built in Sanitary Quick Change feature makes for a mess-free filter change. 100,000- gallon capacity on filter, meaning it won’t have to be changed often. The Aqua- Pure Whole House Water Filtration System- Model AP903 has an incredibly high customer satisfaction rating. Many consumers that purchased this product gave it the highest customer rating possible because it met and exceeded their expectations. This is due to it’s unique features and how noticeable the change in water is as soon as it was installed. One reason many enjoyed this whole house water filter was due to how easy it was to change out the filters. Aqua- Pure whole house filter has a Sanitary Quick Change (SQC) feature, meaning that the consumer won’t have to handle the media filter at all while changing cartridges! It also leaves the filter virtually mess- free, eliminating most spills that could happen while changing the filter. Not only that, but another reason consumers like it so much is because of the high- quality materials used for making it. It is very rare for the water filter to break for any reason. If it does happen to break for the first two years it’s purchased, there is a limited 2- year warranty on most parts. For all the expressed features and advantages, as well as the lack of disadvantages, this whole house water filter is reasonably priced. Between the hassle-free installation, the long product life, and the high- quality materials that are used to make it, it’s no wonder that this product has become one of the top rated water filters to have! All in all, the Aqua- Pure Model AP903 Whole House Water filter is a wonderful product to have, and would make a beneficial asset to anyone’s home. Especially those that have very hard city water. There are numerous advantages shown to come with the Model AP903 Whole House Water Filter. These advantages are sure to benefit the average person within their daily lives. 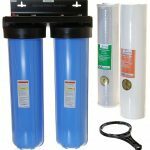 The most popular and most unique advantages for the Model AP903 whole house water filter are listed below. Provides whole house filtration, water is looks, smells, and tastes great after installation. Media filter does not need to be touched due to the sanitary cartridge design. Filter only needs to be changed once every year, or 100,000 gallons. This number depends on number of household and size of home. Corrosion resistant head allows a ‘sweat in place’ installation, very easy to install. Sanitary quick change makes for very easy filter change. There is no need for a filter wrench and it is guaranteed to be virtually spill-free. Provides clean, clear water with no noticeable sediment of any kind once the Aqua- Pure whole house water filter is installed. There are very few disadvantages that are reported when using the Aqua- Pure Whole house filter system. That being said, the disadvantages and defects that are reported are serious and should be heavily considered before purchase. The worst defects and the most complained about disadvantages are listed below. The Model AP903 whole house water filter is not supposed to be used with well water, and if used as such, it will completely void the warranty. Water pressure is known to reduce significantly after a few months. Some have even complained of reduced water pressure after only a month or two. Known to clog, some have even complained that it completely clogs after only a couple months of use. Must purchase a different sediment filter to place before the first filter to avoid this. The Model AP903 replacement filter is moderately expensive, about $150, if it needs to be replaced.